Station established and maintained by the U.S. Geological Survey.Station established and maintained by the U.S. Geological Survey. LOCATION.--Lat 40`25'09", long 79`01'35", Westmoreland County, Hydrologic Unit 05010007, on left bank at upstream side of bridge on State Highway 56 at Seward, 2.0 mi downstream from Findley Run, and 9 mi northwest of Johnstown. PERIOD OF RECORD.--May 1938 to current year. 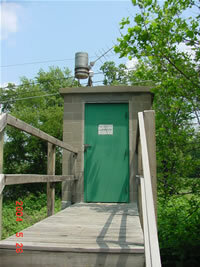 GAGE.--Water-stage recorder and non-heated tipping bucket precipitation gage. Datum of gage is 1,076.01 ft above National Geodetic Vertical Datum of 1929. Satellite telemetry at station. REMARKS.--Flow regulated by steel mills and reservoirs above station; the eight most effective reservoirs have a combined capacity of 51,850 acre-ft. Supplied by NWS: Action stage-8.8 ft; Flood stage-12 ft; Moderate flood stage-14 ft; Major flood stage-16 ft.